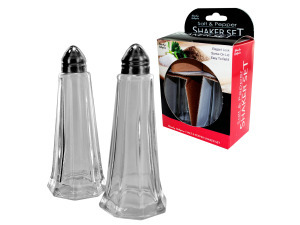 Perfect for any kitchen and great for restaurants, this Salt & Pepper Shaker Set features glass shakers with a sloped shape. Each shaker has a metal lid that easily twists off for filling. Shakers measure approximately 4 3/8" tall and hold 2 oz of salt or pepper. Comes packaged in a hanging box. Box measures approximately 4" x 2.25" x 6". 18 pcs. 36 pcs. 54 pcs. 72 pcs. 108 pcs.